This conversation on concentrated cleaner was sponsored by Greenwald's Citrus All-purpose Cleaner. View our complete disclosure policy here. When you use concentrated all purpose cleaner you reuse the same spray bottle, saving hundreds of spray bottles from ending up in landfills. Buying your all purpose cleaner in concentrated form can save you some cash. A 6 pack of Greenwald's Citrus All-purpose Cleaner costs $16.95, which amounts to about $2.83 per 32oz of cleaner. If you are like me, you like to have a few extra bottles of all purpose cleaner on hand so you are never stuck without any cleaner. 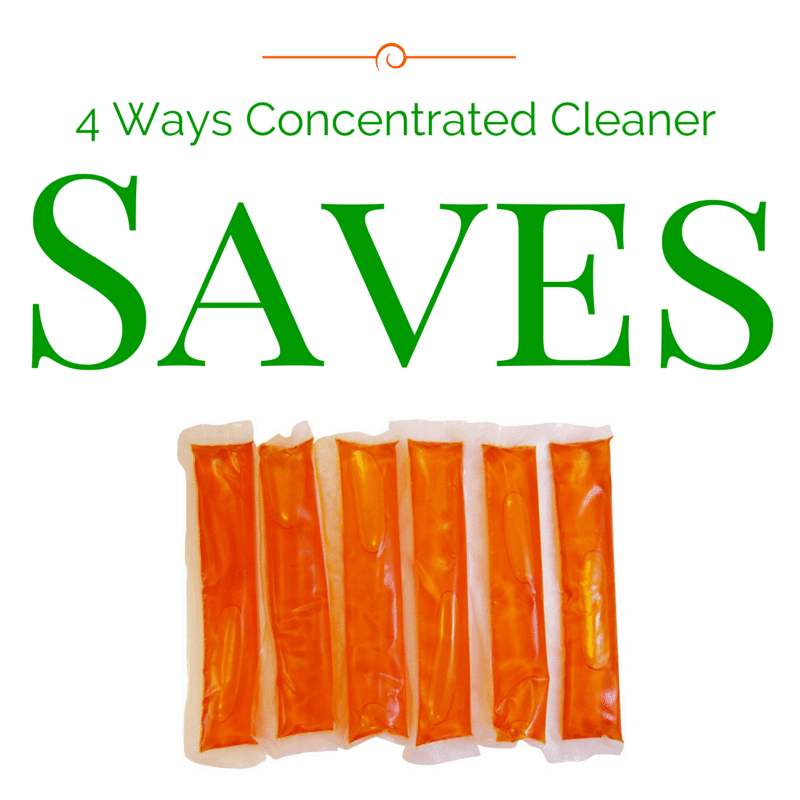 Each packet of concentrated cleaner can fit right in the palm of your hand. You can easily store enough packets to make gallons and gallons of cleaner in the space it would take you to store one bottle of cleaner. You will not have to shop for all purpose cleaner as often, because you will have plenty of concentrated packets on hand. When it comes to concentrated cleaners, Greenwald's Citrus All Purpose Cleaner is the best choice for a single cleaner that is perfect for the entire house. From counters and toilets to gym equipment and kids toys, this all purpose cleaner really does a fantastic job cutting grease and grime without leaving any residue. Plus, it's citrus scent makes my nose very happy! To start, I would suggest the Greenwald's All Purpose Cleaner Starter Kit. This starter kit comes complete with 6 concentrated packets and a reusable 32oz spray bottle. Or, if you have your own 32oz spray bottle, you can order the Greenwald's All Purpose Cleaner 6-Pack Refill instead and save yourself a few dollars. « Dorky’s Deals featured on Dealspotr.com! I agree and I love Greenwald’s Window & Glass Cleaner. I’ve never really put any thought into using concentrated cleaner. I love citrus smells. So much better than other more chemically cleaners. Thanks for explaining why it’s better. I actually didn’t know it was better for the environment, but that makes sense! I haven’t tried this brand yet but I like how it helps the environment. Wow, I’ve never thought about using this type of cleaner. I recently moved and totally could have used it for clean up! Thanks so much for sharing! !